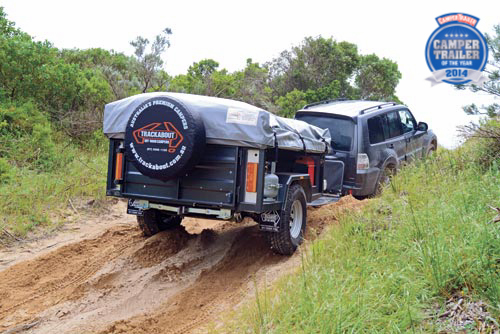 A tough, Aussie-made offroad camper trailer from an industry leader, the Trackabout Kakadu is a great place to start. If you think you haven’t got the budget for a quality, Australian-made offroad trailer, perhaps you haven’t yet considered the Trackabout Kakadu. Coming in at around $15k, this package will serve as the foundation for your ultimate camper trailer, enabling you to add gear and accessories as the budget allows. Trackabout can option the Kakadu up over time, so you’ll eventually have a trailer that resembles something from the upper echelons of the brand’s portfolio. In the meantime, you can rely on the quality of construction and workmanship of this product and take comfort in the knowledge it’ll get you where you want to go. At only 700kg tare and shorter in length than its competition in this category, for me this camper is easily the pick for offroad. It has an Ozhitch offroad coupling, tough seven-leaf spring suspension and 10in electric brakes. On the drawbar there are two PVC pipe pole holders, a large toolbox, a mesh stoneguard and a swing-away jockey wheel. The kitchen is a basic Drifta number which, like the rest of the trailer, is functional rather than showy. The Primus two-burner stove is included and is fed by the 4.5kg gas bottle. An 85L water tank feeds the hand pump and there’s a second tap by the gas bottle to allow for a quick hand wash by the side of the road. The sink is a rudimentary black plastic tub, not flash, but in my view underrated; my kids had their nightly bath in one like this when we went camping when they were younger. It’s equipped with a small cutlery drawer and pantry area for your tucker, though for bigger trips you’ll need a pantry tub that could be stored easily on the tailgate. The kitchen has two handy food preparation areas, all packed away neatly. It’s a Drifta, so you know it’s quality. The trailer as it stands is power-free. While you can’t have everything in a trailer under $15k, it’s a noticeable absence. Sure, the fridge could stay in the back of your truck, but you don’t have any means to light the kitchen area while you cook dinner, or inside the tent when it’s time to put the kids to bed. You may have to drag out the mantles and gas bottle. There is lots of storage on the Kakadu. The bed lifts on gas struts for easy access to this storage area, which makes quick Friday evening getaways easy. All you need to do is lift, throw in your bags and food, hitch up and head off. This simplicity is what this camper is all about. It’s not a huge trailer, being only 7ft, but certainly comfortable enough for a small family. The queen size bed is high-density foam and accessed via an aluminium ladder, and there are a couple of handy storage pockets for keys, phones and similar items. The canvas is Australian-made Wax Converters with 12oz walls and a 15oz roof. It’s an airy, well-ventilated tent, with all windows screened. The awning is what you see — no walls or draft skirt — and for me, having two littlies, I’d need to dip into my sky rocket for some more canvas. Overall, it’s a good, solid, entry-level trailer perfect for those who are starting out, particularly if one of your main priorities is reliable offroad performance. A great entry into the world of camper trailers. 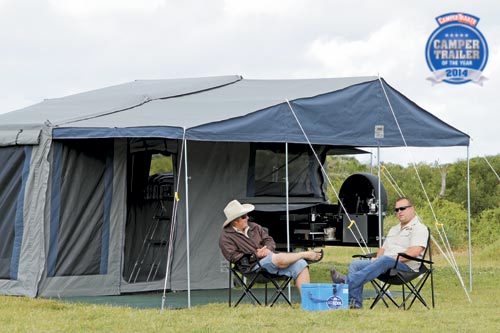 To discover the Trackabout Kakadu's final score be sure to check out Camper Trailer Australia magazine #72. Why not subscribe today! DAVID COOK: As an entry-level camper this is a good place to start, despite the absence of bells and whistles — it’s a good, honest, traditional softfloor camper. Not a lot of extras to make it liveable in the bush, just a basic kitchen, with gas and 85L of water and a bed to sleep in. This is essentially a capable trailer within the constraints imposed by the price. The seven-leaf AL-KO springs and 45mm axle are durable enough for offroad work. The queen innerspring mattress and Drifta kitchen help to lift the Kakadu. If you were coming from a tent camping background, this would lift your camping experience hugely at a minimal price. STUART JONES: An affordable, well-credentialed starter pack trailer that’s up to the rough stuff.There’s not much included at this price point, but this allows those on a budget to upgrade easily one step at a time. It doesn’t come with power as standard, so unfortunately it doesn’t score too well on the self-sufficiency front. The finish is excellent, but the fittings are few. The build is very tough, and it wins points on the offroad front — very light, tried and tested. Will get you to the Cape and back. Basic, usable kitchen, portable gas stove, no walls or floor for annex. An easy overnight set-up; just flip her over. Quality, well-established brand, so good resale value. This camper offers toughness over fittings and comforts, and would be perfect for the simple bloke that likes to do the work himself, or who wants to the ability to upgrade as the budget allows. MIKE PAVEY: An entry-level, all Australian-made camper, though nothing really new. Good finishes: fully galvanised chassis, quality paint preparation, powder-coat finish and Zincanneal panels. Offroad coupling, LT all-terrain tyres, hubs matched to most vehicles, AL-KO outback HD shackle springs, substantial chassis, large angled stone guard to deflect stones down, and electric brakes. It’s got innerspring comfort, a long drawbar, a 10ft tent for reasonable space inside and a quality Drifta kitchen, but no fridge or electrics. An easy setup and use. Footprint would suit most families for space without labouring from excessive canvas setup (as in bigger tents). Likely carries a good resale. A basic but well-built family camper.